Lo and behold, the Huatulco airport terminal is a palapa: modern, spacious, very 21st century, and covered with palm thatch. It speaks like an icon: “Put your city cares behind you; welcome to the paradise of the coast!” Yes, but they’ll have to re-thatch it every three years or so. Five if it doesn’t rain much, but if we have five successive years of drought there won’t be any money to hire the re-thatchers anyway. Deborah and Les entered the passenger lounge about 11:00 for their trip back to the “real” world. I did a 180 and headed for the mountains. For the past several years I’ve stuck very close to home with Linda, as her physical dependency increased along with my emotional needs, and we learned how to dovetail with each other in new and increasingly strengthened ways. When we hosted visitors —and there were lots, and we always found the visits enjoyable and stimulating and wished there were more— we used home as a base and I led excursions up and down the inexhaustibly interesting Central Valley, and we shared our experiences with Linda at dinner on our front terrace overlooking Monte Albán and Atzompa. But wandering on my own, letting my head rattle around during some protracted solitude while I went exploring new places and new experiences . . . not so much. So, since our friend Celina Cruz had agreed to stay in the house and engage with Qalba for an extra week, I set out to wander the mountains and coastal forests between the resort villages near Puerto Angel and the petroleum refineries and windfarms of the Tehuantepec Isthmus. I picked three towns to use as bases. Pluma Hidalgo, at about 1,500 meters, where they allegedly grow the best coffee in Oaxaca. Huatulco, the invented resort city on the coast, whose palatial 5-star hotels abut a large national park with allegedly one of the most diverse bird populations on the Pacific coast. And Ixtepec, a small city at the edge of the mountains that rim the Isthmus plain, which is not far from the ruins of Guiengola, a site reputed to be interesting, seldom visited, and more or less accessible by car. The glory of Pluma Hidalgo (“Pluma,” for a nearby dominant peak; “Hidalgo” for the hero of Independence) is its coffee, which became the dominant cash crop in the region after some developers from Miahuatlán seeded thousands of young coffee plants on the steep ridges of the Pacific Slope nearly 200 years ago. By the end of the 19th-century Pluma Hidalgo coffee had won fame as Mexico’s best, and the ridge-top town had grown to 7,000 people. Today there are fewer than 2,000, and the number appears to be shrinking rather than growing. The culprit is a fungus called la roya that dries the leaves of the coffee plants until they fall off and starve the roots. The plague first struck in 2013, and the 10,000 sacks annual production of Pluma fell to 5,000, and to 2,000 in 2015. Some 40% of the people who made their living picking coffee have dropped out of the business. Some have emigrated, some have switched to poaching lumber from the forests, some have pursued violent solutions to their economic woes. Town leaders have sought to have the village declared a “Pueblo Mágico,” recognizing that this will require a good deal of general spiffing up and a concerted effort to create tourist events and facilities promoting coffee: cabins in some of the coffee plantations, tours, perhaps a museum, demonstrations of the picking, cleaning, and roasting processes. Since there appears to be very little capital in town, the effort will also require some massive government intervention, both for the local infrastructure and for the access roads, the spur to the Oaxaca/Puerto Angel road, and the connection to Huatulco. The hillsides up there are close to vertical, and any massive rainstorm or shaking of the earth seems to bring tons of earth down onto the roads, or to send large sections of the roads plummeting into the valleys far below. I approach on the 12-kilometer spur from the Pochutla-Oaxaca trunk road, over alternate sections of dirt and pavement, inching my way past the three places in which the washouts have left, at best, nearly a single passable lane. What with Pluma’s fame, I expect to come down to a substantial village nestled in a mountain valley, circled by gentle hills sown with coffee plants. What I find is a thin town of one-story buildings strung out along knife-ridge with a few other houses above or below the main street depending on the precipitousness of the terrain. The locations of a few coffee plantations on the side roads are marked with signs. The main street shows signs of neglect: building unpainted or with fading paint; mold; almost no businesses except a handful of abarrotes (neighborhood groceries for mostly unperishibles), a restaurant, and two comedores (smaller than a restaurant, generally serving one or two dishes that the cook has decided to prepare that day), and a small clinic, run by the Israeli Peace Corps. And the Pueblo Mágico? Well, there is a mural. And signs in English and Spanish explaining how coffee is processed. But, for the moment, that seems to be about it. Pluma’s main tourist facility is an ex-hacienda de café that has morphed into a pleasant little ridge-top resort, the Finca Don Gabriel. A restaurant, a few hotel rooms, cabins (as expensive as, but with none of the amenities of our cabin in San Agustinillo a few days earlier), a pool with hammocks, landscaped paths that run laterally along the steep slopes, lots of exotic flowers, and views on every sides of landscapes that seem to roll away forever. I stayed two nights and spent the intervening day hiking and birding high on the ridges above the town, talking to folks along the way. Lovely time, well spent. The second morning I hiked the ridges one more time and then drove d-o-w-n to Huatulco, and found my little boutique hotel by the National Park (Casa Blanca del Sol which I would recommend). Because I was exhausted, and it was hot and muggy, and the room had air conditioning, I napped for an hour, took a refreshing dip in the pool in the hotel’s garden, admired the yellow-cheeked woodpeckers admiring me paddling around in the water, and then went for a drive. 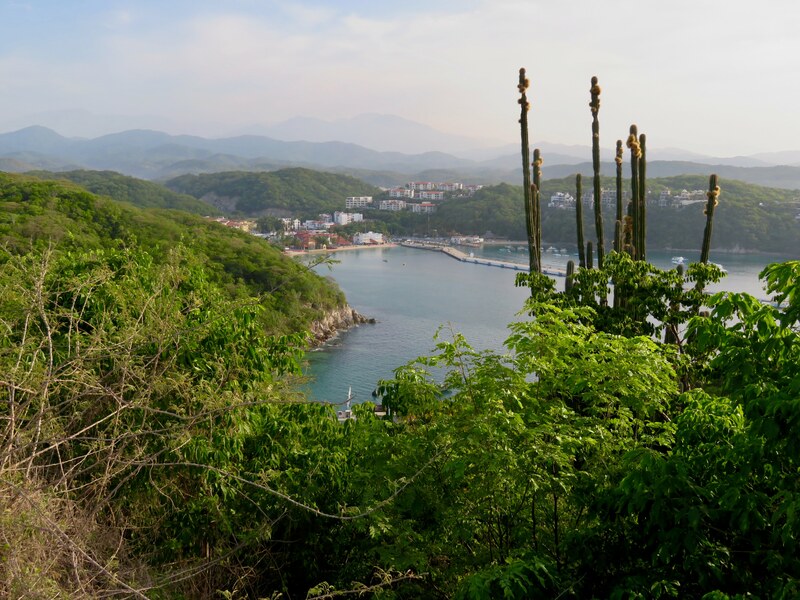 Huatulco is an extended series large hills that jut out into the Pacific, leaving tiny sheltered bays with beaches in between. The geography thwarts big waves, so the water is calm and perfect for families with little kids. Hotels, some in the flat deltas behind the bays next to the bays’ commercial areas —restaurants, swimming supplies, convenience stores, travel agencies, and high-end clothing and jewelry. The most luxurious hotels have staked out the hills and have their own private beaches. Tangolunda Bay even has a golf course. If you have to ask the cost of these places you probably shouldn’t attempt them. Our bay – Santa Cruz Huatulco —with its jetty where the cruise boats dock—is probably the most middleclass section of the Huatulco bays. At one end Huatulco is the Copalita Eco-Park with its tiny ruins perched over the sea. At the other is the much larger National Park: bare cliffs at the ocean edge, rolling scrubland on the hills, densely forested copses in the gullies, with a few dunes and marshy spots at the heads of the smaller bays. I had expected to hike it, and in the car had boots, a knapsack, and plenty of water. But the Park turns out to be effortlessly accessible, with well manicured beautifully landscape roads winding all through it. Lovely, and too bad, in equal parts. There is no place for one to have a sense of getting away from it all. There is no solitude. On the other hand, the Park still seems to teem with wildlife, and both the young and spry and those of us of a certain age can get to see a lot of habitats in a relatively short time. Once a year, during the last fifteen years or so, on one of our travels Linda had treated me to a day of birding with a local guide. Expensive, but a great learning experience. Locals know the habitats, the rarities, and what is likely to be where, and when. They tend to know the names of birds in the three main languages: theirs, yours, and Latin. The good ones are not only knowledgeable, but are great pedagogues. This year I treated myself, contracting with Cornelio Ramos, who is glowingly recommended all over the internet. Deservedly so, in my quickly formed opinion. Cornelio asked what I wanted to see. Less than 90 seconds after leaving the hotel, he pulled the car to the side on one of the Park roads, Cornelio leapt out, set up his telescope, and pointed to a roadside bank of scrub. On the other side of the road he —and then we— heard magpie-jays and motmots. Two of these—rufous-browed motmots— posed obligingly in a tree about 30 meters away. Over the next few hours we cruised here and about through the Park, and I got to see and hear a lot of birds that with which I was not very familiar. Some of the calls were repeated often enough so that, at least for that day, I could distinguish by myself the difference between the sound of a happy wren and a russet-crowned wren and know where in the scrub I should look to try to see them. We also copped some spectacular views of the coastline, though the shore birds that I had seen in a previous trip were off doing something else that day. It turns out that Cornelio, in addition to his many talents, is special in another way: he is a native Huatulcan, having been born in the village of Copalita, on the northern border of the Huatulco bays. Late in the morning we drove up to a large patch of forest on the inland-side of the coastal highway that was left to him by his father. Cornelio works with SECTUR and several other organizations and has formed a small company, Zibii’lu, to develop the land as a pilot in integrating biodiversity and ecotourism. We spent the next couple of hours traipsing through the forest. Among the many things we saw —lizards, trees and shrubs with medicinal properties, insects, lianas, garnet-bearing volcanic detritus— we were surprised by two very odd birds: a Pacific Screech Owl that makes its home in a hollow in a tree, just like the owls in the Disney cartoons; and a Northern Potoo, a nocturnal feeder that spends its days pretending to be a tree. What we didn’t see was the Doubleday’s hummingbird. That is, not until we turned the corner in Santa Cruz Huatulco by the morning coffee shop and saw one feeding at some purple flowers that decorated the median in the street, and then was gone in a flash. The next morning, however, I had three surprises. I got up early, checked out of the hotel, and went to the coffee shop for breakfast. I ordered eggs and coffee, and then trained my binoculars on the purple flowers. A flash of bright orange: a cinnamon hummingbird. Up and down the row of flowers; into the tree for a quick perch; back to the flowers. It’s a spectacular little bird, and I tried for pictures, but the rapid motion, and the need to both aim and focus, made it almost impossible. And then a dark competitor, with a forked tail and a red bill, darted into view: the Doubleday’s. I was excited, but the cinnamon hummer was incensed, and drove it away before I could even get my camera out again. Then the dance was on. Cinnamon perches, Doubleday returns, Cinnamon attacks, Doubleday flees, Cinnamon perches . . . . I heard the waitress bring my eggs, so I turned back to my table and ---the third surprise! Somebody was sitting there. Alberto Zamacona, our family physician from Oaxaca City, come to the coast and got up as early as a birder to retrieve his pickup truck that was undergoing some repairs resulting from his last excursion to bring his clinic to remote villages near the coastal mountains. I had left two more days for wandering, one for the road to the Isthmus, and one for the road to Oaxaca. I had asked Cornelio whether any of the inlets or beaches along the 150 km road to the Isthmus were worth poking into (answer: shrug of shoulders), and had spent a couple of nights with Google Earth to see if I could spot any promising lagoons or swamps. Only one place caught my eye, what appeared to be some sort of large pond in a depression in the 15-kms or so that separated the village of El Coyul and the beach. What the hell, worth a try. Maybe there will be a road. The main road to Salina Cruz is two-lane and very winding but in decent repair. After about an hour I come to El Coyul, a small village dug into the sandy scrub on the ocean side of the highway. There are not many people around as I drive the village, so at the far side I choose the first track that heads southwest, which is ocean-ward, and proceed about a kilometer until the road peters out in loose sand that I don’t want to dry to plow through with the CRV. I back up fifty meters or so to a patch firm enough to turn around on and head back to town. Now I see people. The first two I ask furrow their brows in puzzlement at the word laguna. I run through synonyms: Lago? Charco? Presa? Zip. The third, a boy of about 13, shows signs of recognition and gives me a complicated set of instructions —involving a house with a lamina roof (most of the others in town are thatch), a capilla (evangelical, to distinguish it from iglesia, which is Catholic), and a yard in which 8 or 9 burros will be tethered. The road to the laguna begins there, he says, and it’s about an hour’s walk. I estimate, what with the sand, 4 or 5 kilometers. I find the burros and locate the sandy track heading southwest. Dry scrub forest of low trees, 2-3 meters tall. Mostly firm, until it crosses a dry wadi that, again, appears to be loose sand. Several deep furrows, wide but not parallel to each other, which suggests a moto, and parallel narrow ruts on either side of two rows of hoof-tracks that look like oxen. I stop the car and walk across the wadi, estimating where my right tires would have to go. OK, the underlying surface is fairly firm. Then I turn and walk back over the bit that my left wheels would have to cross. Still OK. The CRV and the ox cart seem to have the same wheelbase! Oh well, what the hell; if I get stuck here I can walk back to town in maybe a half-hour, and the owner of those oxen will probably have a rope to pull me out. And about 2 km later I see a white hawk stooping over something, and a wedge of 6 neotropic cormorants gliding down. That has to be the lagoon. I round a bend, and am greeted by the sight of birds on water. There are the three-dozen cormorants in a raft that my 6 have come to join. There is a line of white pelicans (brown pelicans are common all up and down the Pacific coast, but these are the first white ones I have seen). And on the shore there are others. There is a fisherman, too, casting a small, weighted net to haul in mojarra, a kind of bream. By the time I finish prowling along the shore and through the brush with my binoculars and camera he has brought his boat to shore along with a bucket full of fish. The jacana searches the sand by the boat in hopes that the fisherman will have dropped something good to eat. The fisherman and I introduce ourselves. “Joel Roblels, para servir.” At your service. We chat for a while about the fishing business, the lagoon, the pelicans, and the strange rainy season with so far very little rain. I offer him and the bucket of fish a lift back to El Coyul. In the car on the way back he tells me that he fishes almost every morning. His family eats mostly fish, and if they have extra they sell in in Salina Cruz. Sometimes he takes it in on the bus, and sometimes he sends it with a friend. I ask him if he also farms. It’s tempting, and it would be fascinating, but I beg off, inventing some pressing business down the road, but thinking that the family will fuss, and without me they will eat sparingly, and these fish are their only source of income. I drop Joel and his bucket of fish along the sandy road, a hundred meters from his home, since the last bit will not accommodate a vehicle. An hour later I’m in Salina Cruz, and then in Juchitán, gawking at earthquake damage in the cities, and marveling in-between at the vast rows of windmills that line the road here in Mexico’s largest campo eólico. The evening is for listening to heavy metal in Ixtepec, and next day for the drive up, over, and through the Sierra Madre Occidental to Oaxaca and home.